Zbigniew Preisner is Poland's leading film music composer and is considered to be one of the most outstanding film composers of his generations. Among many recent awards and citations Preisner received the Silver Bear from the Berlin Festival in 1997, two Césars from the French Film Academy - one in 1996 for Jean Becker's Elisa, and one in 1995 for Three Colours Red - and three consecutive citations as the year's most outstanding composer of film music in The Los Angeles Critics Association Awards of 1991, 1992 and 1993. Preisner is a member of the French Film Academy and in 1992 he received the Award from the Minister of Foreign Affairs for outstanding achievements in the presentation of Polish Culture abroad. 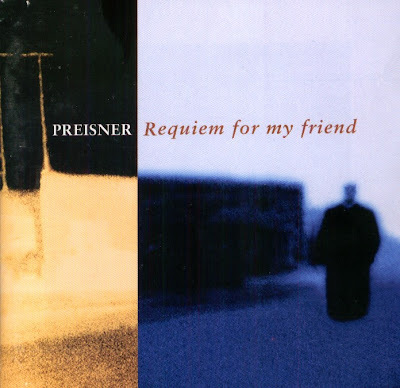 Requiem for my friend is Preisner's first large-scale work specially written for recording and live performance. "Once we had a joint conception to create a concert telling a life story. The premiere was planned to take place on the Acropolis in Athens. It was intended to be a large event, a hybrid of a mystery play and opera. Krzysztof Kieslowski would be the director, Krzysztof Piesiewicz was responsible for the script, and I was planning to compose the music. Once, we thought it might be the first of a series of musical performances, to be developed in various interesting places around the world in the next few years. But it was life that authored a different ending: Krzysztof Kieslowski died on 13th March 1996. The Requiem for my friend is one of my favourite Requiems. Thank you for this masterwork. The CD was released by ERATO, 1998 (DDD). 3984-24146-2.